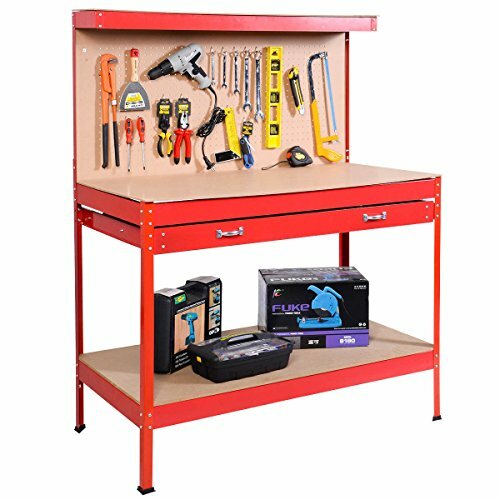 Our Red Heavy Duty Working Bench Is Made Of Solid Steel And MDF Panel. Two Roll-Out Drawer Provide Enough Space For Storing Tools. It Also Has A Work Surface With A Sturdy MDF Board, And A Sturdy Peg Board For Organizing Smaller Tools. The Bottom Shelf Is Designed To Store Heavy And Large For You. With This Item, You Can Tidy Your Tools And Take It Directly. It Is Ideal For Storing Tools, And Getting Work Done Around The House Or In Your Business. Do Not Hesitate To Buy One!